Each year, the Wake Forest family gathers for the Founders' Day Convocation to observe the University's founding in February of 1834. 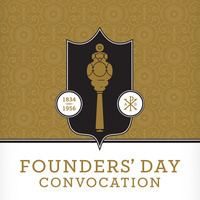 Wake Forest will hold Founders' Day Convocation on Thursday, Feb. 21, at 4:00 p.m. in Wait Chapel. The University's highest honor, the Medallion of Merit, will be presented, and faculty awards in the areas of advising, teaching and service will be presented. As is Wake Forest tradition, this year's winning Senior Orations will also be delivered.